2019, in terms of eminent quality buyers and new furniture collective, is testament to its power of attraction and its capacity for involvement and excitement, palpable in the exhibition during its debut at the Sands Expo and Convention Centre, Marina Bay Sands, from 9 to 12 March 2019. Widely recognised as Asia’s leading destination for business, leisure, lifestyle, and entertainment, the new picturesque fair venue received rave reviews from both exhibitors and trade visitors alike, and will be the anchor venue for the next four editions of IFFS. 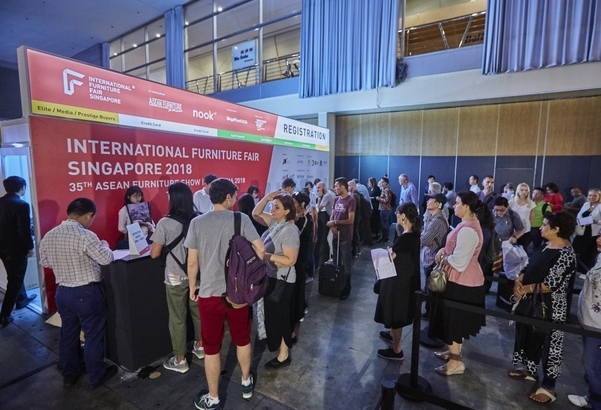 15,126 attendees, 95 overseas buying delegations, in 4 days, from 87 different countries, with 204 exhibitors who displayed signature showcases to the fair’s new theme of ‘UrbanAsia – the Future of Urban Living’ in the 2019 edition, along with the co-locating 36th ASEAN Furniture Show and NOOK Asia 2019, representing the furniture, furnishing and interior design industries. remains the preferred choice as an all-in-one stop for their sourcing needs across the entire furniture and furnishing ecosystem, with follow-on orders expected for the year ahead as a result of the plentiful business opportunities and bountiful business deals presented at the fair. Displaying their latest urban living collections and solutions to address the aspirations and lifestyle needs of an ever-growing urban population, the 2019 edition has over 100,000 exquisite pieces from around the world, including well-known brands such as Anno 13 (Belgium), Asiades (Hong Kong), Deesawat (Thailand), District Eight (Vietnam), HALO (Hong Kong), KODA (Singapore), Life Outdoor Living (Belgium), Lumas Gallery (Germany), Manutti (Belgium), PR Interiors (Belgium), Reeves Design (Vietnam), Talenti (Italy), Tetrad (United Kingdom) and Woven+ (The Netherlands), strategically positioning IFFS as the launch-pad to penetrate the international markets.